Episode begins with The Flash fighting Dr. Light and being hit. He is down on the ground and she grabs his flash emblem. Flash to current time and Barry is interviewing Dr. Light who wants to be let go and to disappear. Barry asks for her help. Barry lets the group know that they can set Zoom up. Joe pulls Caitlyn and Cisco aside and expresses his concern and lack of trust in Wells. He wants Cisco to "vibe" with Wells. Flash back to Wells talking to his daughter and her asking if he created meta-humans. Jessie is disappointed with her father for covering up his involvement. Patty and Barry flirt at the precinct after Joe shuts her down about the Dr. Light case. Dr. Light goes invisible and escapes. Cisco tries to Vibe on Wells and he freaks out on him and tells him not to do it. Flashback to Oliver Queen going missing on the news then it talks about the school being attacked and Wells tries to call his daughter. he sees the cell phone of his daughter cracked. Wells is upset. Patty tries to get Joe to open up about what is going on but does not. Linda is cooking up a storm and Barry and Iris decide that they will let Linda help set up Zoom. Cisco makes fake gloves that shoot out light and they have Linda practice. Funny moments of Cisco having to adjust the gloves but Linda practice using them. It was a funny moment. Linda questions her ability to really do it. The Flash talks to her to help motivate her and he reveals himself to her and says he knows her and knows she can do it. Cisco tries again to touch Wells and her finally Vibes. Cisco sees Zoom holding Jessie. Patty demands the truth from Joe but he refuses. Right after Barry says he is unable to do dinner because he has something to do with Joe. Linda as Light vs The Flash in a bad acting moment. Barry fakes going down and Linda grabs the emblem and throws it into a breach. Now they wait for quite some time. Wells is mad. They give up on the set up. Barry goes back to the precinct and sees Patty. He gives her a great kiss and says that she makes him happy. Linda and Iris talk at the newspaper. They share a moment and Linda leaves and she comes face to face with Zoom. Iris realizes that she was taken. Barry runs to confront Zoom on the roof who is holding Linda. Barry is able to save her. Barry runs real fast to thunderbolt Zoom who just jumps in the air and grabs a bolt of lightening and throws it back at him. They start a serious game of chase after Zoom says heroes die. 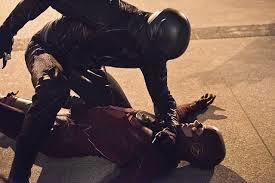 They begin a fight where Barry is not doing well. 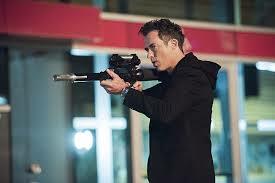 Wells tries to shoot Zoom but he catches it and stabs Barry and takes him to the the paper and the precinct and shows that the Flash is no hero and that they will not have him any longer. Zoom continues to drag Barry like a rag doll. Cisco is able to shoot Zoom while he holds Barry but Zoom gets away. Barry is going to be okay. Wells finds out via Cisco that his daughter is alive and he wanted Barry to help him but he was wrong. Barry wakes up and realizes that he cannot feel his legs. 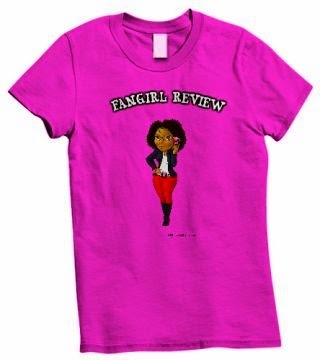 Fangirl Thoughts: Great episode! Now this is the episode I was looking forward to. Zoom comes in and handles everyone! He is a beast and I loved every minute of it. He makes you root for the bad guy! I really enjoyed when he caught the bolt and threw it back at The Flash. Then dragged him around like a rag doll and was determined to destroy him before he killed him. It was amazing to watch him. I really look forward to what will happen next week since Barry is unable to walk and no one is there to save the city.